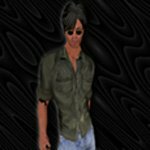 Every Friday night at Harmony Cafe, we welcome DJ Tarsis, who brings to Second Life the live version of his alternative rock podcast, Alternative Classix. Tarsis spins an eclectic mix of classic alternative rock from the 80’s and early 90’s, featuring groups like The Cure, Depeche Mode, Visage, This Mortal Coil, The Misfits, The Dead Kennedys…. need I go on? Either way, the party is fun, the music is great and the people who join us each Friday night are a smart, funny bunch of art & music lovers, many of whom I am pleased to call my friends. We’ve even thrown together an 80’s Trivia game where you could win 500L if you’re not too embarassed to admit you knew the answer! Look for Tarsis and the gang at Harmony Cafe every Friday Night in Cetus, Second Life! See the blog and website links on this page for more information on Alternative Classix. 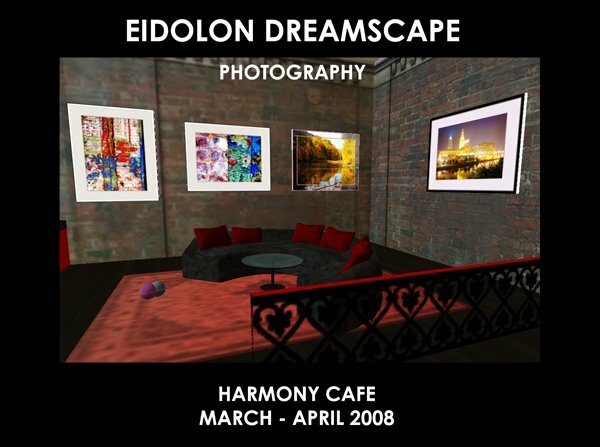 Starting Friday, March 28th Harmony Cafe welcomes Eidolon Dreamscape to Harmony Cafe. His real life photographic works will be featured in the cafe for the next month. Of Eidolon’s considerable collection of photography, I chose the peices we featured in Harmony this month for their color, the bright lights and the general high energy feel of them. I thought the colorful photographs went well in the warm red and black interior of the cafe, and positive feedback was recieved all night long as we partied with DJ Tarsis and celebrated Eidolon’s opening. This is Eidolon’s first show in Cetus Gallery District and the first time I have featured one specific photographer in the Cafe. The party was a great time and, I think, an auspicious start to a new feature of the Cafe. Welcome Eidolon to Cetus and stop by the Cafe to check out his work! A popular hangout (if I do say so myself) in the Cetus Gallery District is the Harmony Cafe, located on the Cetus River Walk. Opened in October 2007, the cafe has become a favorite place to sit and chat in front of the fire, relax at a table and sip espresso or hot cocoa with a friend or spend an evening dancing to live performers and DJs. Harmony has hosted live music performances from fantastic performers like Louis/Luigi Volare, CraigLyons Writer, Noma Falta, Nance Brody and more. Every Friday night, join Harmony and DJ Tarsis Korobase for Alternative Classix Live. Tarsis hosts an alternative rock podcast (it can be found at http://www.alternativeclassix.com) and on Fridays he brings it to SL live via the Harmony Cafe. Stop in and dance to alternative rock hits from the 80’s and early 90’s! Not forgetting that the Cafe is in an art district, I have incorporated artwork into the decor. 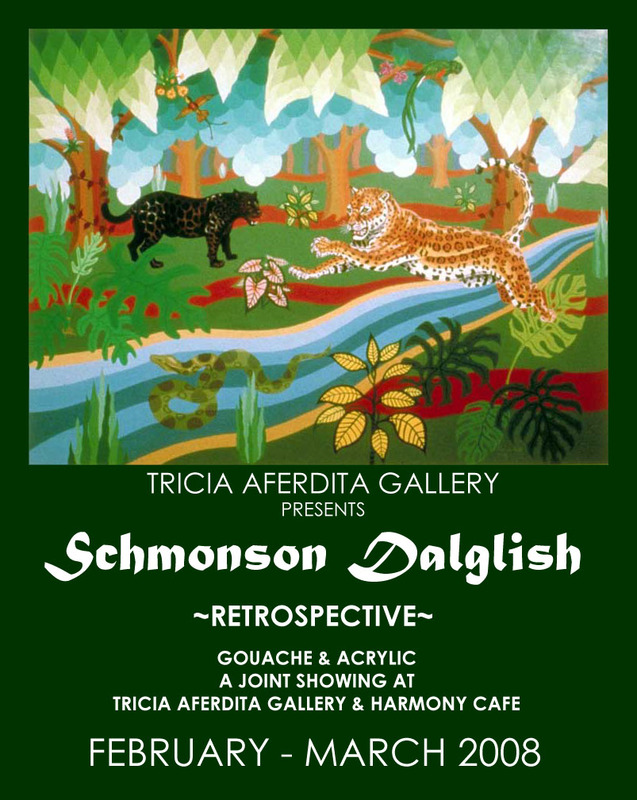 It started as an eclectic mix of work from artists around SL, but I am currently featuring the art work of Schmonson Dalglish there (along with the work displayed at Tricia Aferdita Gallery). 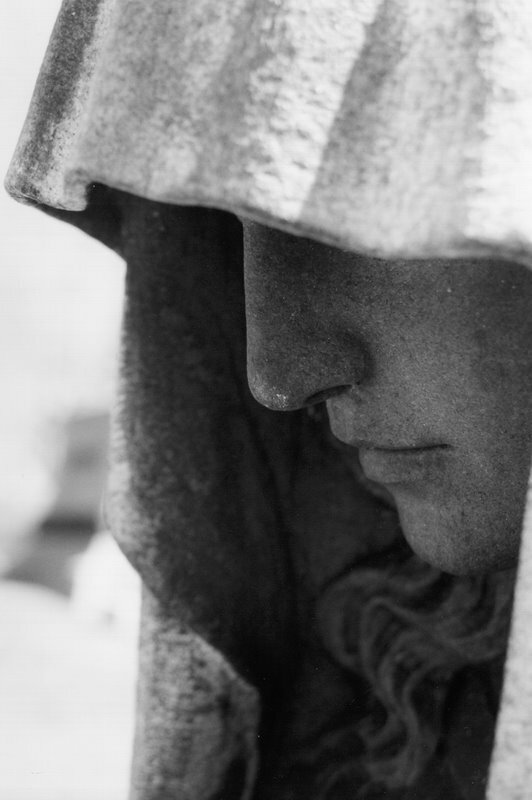 Next month, I will feature Cetus’ own Em Larsson, owner of Gallery M and a few of her fabulous photos. While you’re in Second Life, take the time to stop in and have a cup of coffee or stay for a while and party with us. Our gatherings are filled with fun and laughter! Cetus Gallery District Vice President and Twilight’s Peace owner Jonah Zenovka, along with his partner Alexxa Laval, recently took the initiative to help me start making better use of our outstanding Community Center in Cetus Gallery District (Second Life). Having previously featured the works of SunFlower Aichi along with a night of fantastic guitar music by Joaquin Gustav, we kicked off this project in conjunction with Twilight’s Peace and the Cetus Gallery District Association (CGDA). A portion of the proceeds benefit CGDA and help us keep bringing great live performers and events to the district. PJ is the owner of Exposure Fine Art Photography, with galleries in Cetus, Fairchang NW and Landon. He is also the owner of Render, a fast rising graphic design service providing profile photos, business signs and event posters. He is quickly gaining popularity in the SL music scene for his fantastic musician and musical event posters. PJ is generously donating 50% of his photography sales to the Cetus Gallery District Association. Join us on Wednesday, March 19th at 7pm SL time at the Community Center as we kick off the exhibition with a performance from rising SL star Vienna James. With her signature mix of sweet and sultry sounds, influenced by Eva Cassidy, She’ll share music from her favorite artists, such as Garbage, Alanis Morrisette, Evanescense, Tori Amos and classic tunes from the 80’s. And maybe, just maybe, she’ll pull out an original tune, just to throw you off! Born in Woonsocket, South Dakota, his family moved to Massachusetts during his youth and he is now a resident of California. A year of living in Istanbul, Turkey imbued him with a sense of universal harmony. There he started painting and developed an original style using complex geometric patterns to represent natural objects. He works primarily in gouache, but paints with acrylics on canvas for larger works. He also draws portraits in pencil. He received his education at the Museum School of Fine Arts, Boston and exhibited in several one-person, invitational, and juried exhibitions both locally and nationally. His paintings have been sold to many national and international collectors in Boston, New York, Los Angeles, San Diego, New Haven, Providence, San Francisco, Chicago, Istanbul, etc. For those of you not in the know, Second Life is an online community created by its residents. The possibilities for creative outlet in Second Life are literally limitless. There are people who build houses, furniture, musical instruments, cars, boats, robots, dragons, technology and shoes. There are clothing designers, “skin” designers, avatar designers, landscapers and scientists. And my personal favorite…. there are artists. Second Life is a natural draw to the creative and curious. It all starts from the moment you first log on. You stand there, your Avatar (the digital version of you) is just like all the other Avatars, a blank slate. You start out, changing your hair color, adding muscles, slimming down, bulking up. Then you tweak the shape of your nose, make your lips a little fuller, eyes a little smaller. Each Avatar becomes a work of art of its own. There are Barbie figures and the macho manly men, but there are furry Avatars, wolves, bears, cats and more. Blue people! Scaly people! I have personally seen dragons, dinosaurs, Santa, a chimpanzee smoking a cigar, Mr. Potato Head and a naked fat guy. Your appearance is truly only limited by your imagination. All that, and you just started to explore Second Life! I wandered onto SL shortly after hearing news report on NPR. I just sort of randomly explored for a few days, and got some friends interested. Then one of my friends meets a guy who helps people open art galleries in Second Life. He introduced us, as my friend knows that I am an artist. Before you know it, I’m full swing into opening an Art Gallery! Me! What was I thinking??? Turns out, it’s actually been a pretty great experience. There are so many artists and art lovers in Second Life, I meet new great people every day, and I have come to enjoy helping others get their art into the world. Tricia Aferdita Gallery is located in an artists community that Second Life Resident Xander Ruttan has created. Our plan at Ruttan Lane Galleries in the Cetus Gallery District, is to create a community where Second Life Residents can have Art Galleries, meetings, lofts and living spaces. The community includes a group, the Cetus Gallery District Association, of which I (aka Tricia Aferdita) am President. The goal of the Association to to provide a means of communication and support among the residents, artists and gallery owners of the Cetus Gallery District. So please! Feel free to stop by my little world anytime! Meet my crazy friends! I have new artists on display every month. Check this blog frequently for new artists and events. *To access Second Life, you will need to go to www.secondlife.com and sign up for a free account. You will also need to download the program used to access Second Life. When you log in, feel free to search under people for Tricia Aferdita, and instant message me, I’ll be glad to help you get started and get to our community!